If you need fast, dependable printing in the most space constrained areas, you need the ZD410. This ultra-compact “fits anywhere” printer is designed for the smallest of work spaces. When it comes to flexibility, the ZD410 shines — this printer creates high-quality labels, receipts, tags and wristbands. This super-fast printer keeps your workers productive. Deployment is a breeze with a wide range of modern connectivity options. The ZD410 is easy to use, operate and troubleshoot, ensuring your printer is always up and running. And Zebra OneCare service maximizes the availability and productivity of your ZD410 printers with unmatched from-the-manufacturer support that covers everything, from worn out printheads to normal wear and tear. 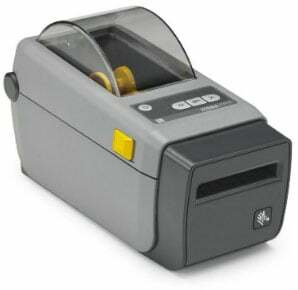 The ZD410 is the little printer designed with big business functionality. A more space-saving design to fit in the tightest of spaces. Best-in-class print quality with a 300 dpi option for small labels, specimen containers and more. Disinfectant-ready plastic model is ideal for clinics, labs, pharmacies and nurse stations. More media flexibility with standard movable media sensor accommodates off-centre black marks, die-cut notches and more. Updated user interface makes it easier to use and troubleshoot. More connectivity options including 802.11ac Wi-Fi and Bluetooth 4.1. All with plug-and-play replacement of aging Zebra LP2824 Plus and competitive printers.